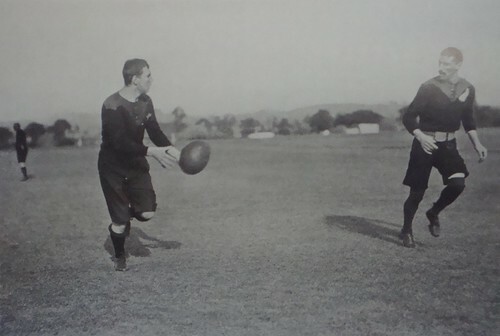 I’m told that in rugby’s “good old days” wingers suffered two dangers based being stood way out near the touch line. The first was suffering the wrath of forwards should he be too big headed about the tries he scored, having only been able to do so because of the hard work of those who play in the middle of the park. The other was freezing to death from lack of action should those players decide to knock him down a peg by not sending the ball his way. Modern wingers are now part of what must be a ‘Back Three’ unit and as such, must not only have a similar skill set to full backs, but must also be more involved and aware of the ‘big picture’ of both attack and defence. No longer are the wings just those two fast players you stick out wide, hoping they can beat the other lonely fast people who share the same lonely outside channel. As full backs are continually popping into the action, the opposite winger has to come across and cover their absence in the event of a turnover and/or kick back. This requires the Back Three unit to be in constant communication with each other and to have an awareness of and trust in each other’s abilities. Their speed and fitness should be used to good effect in defence to enact ‘cross cover’ defence against wide breaks. The on-side wing and full back usher the attack to the touchline, and the off-side wing slides into the middle, but also must be prepared to push all the way across to the other side of the field should the attacking team get around the initial coverage. In such a situation, the on-side wing might have to slide back to the middle of the field in case the ball comes back across! This is just one example of why this group of players must communicate with each other. Wings should also be key organisers of wide defence in calling for support to shore up the midfield while marking the outermost attacker. One of the most effective units this season has been the Northampton trio of full back Ben Foden and wings Bruce Reihana and Chris Ashton. All three are exciting and very efficient, but it is Ashton I have been most impressed with – and would call the best right winger in the game at the moment. It’s not just that the 23 year old rugby league convert has an incredible try scoring rate, with 15 tries in 18 games (over 20 in all competitions), and having broken the old Nat One record scoring 39 in his first season in Union. Ashton’s brilliance is in how he goes looking for those tries, the mark of an incredibly useful winger. Similar to the way Kiwi Doug Howlett was in his prime, Ashton will regularly ‘come off his wing’ to assist in the attack elsewhere. 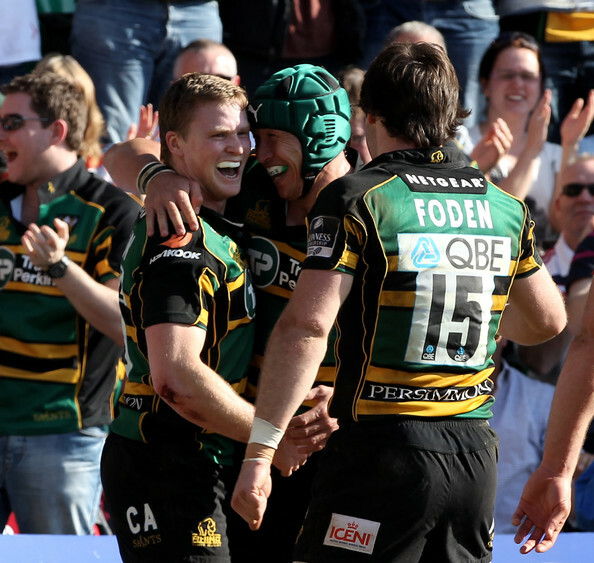 It is this desire to get involved that sees him pop up and score tries in many areas. If one looks at the following video clips, his name is almost always heard in each try as either scorer or creator and not always from the typical winger’s channel. If we had the benefit of seeing the whole field in each of these occasions Ashton was ‘out of position’, I am sure you would see how other people would be in position to cover potential turnover kick backs. However, I feel there are times when the threat to the opposition is very high and the risk of conceding is very low – when attacking inside the 22m area. Wingers should take advantage of what I call ‘shadow support’ – positioning themselves behind the fly half to pop into the attacking line suddenly, having used the players in front as a visual screen. Inside / outside passes from the fly half, or moving wider to be the strike runner with the centres acting as decoys are moves often used at the top level, and should be more effective at the amateur level! (Click here and here and here for examples.) In such ‘risky’ cases, I don’t mind seeing everyone get involved as the likelihood of a turnover being costly in terms of points is very low. My favourite example of the winger making such a calculated move is in the second video’s final try – you can see Ashton jogging all the way from the far right to join a deep break on the left. I don’t even think he was calling for a pass to get the hat trick, but had arms outstretched to celebrate what he thought was going to be Reihana’s try! On top of all of his good work on and off the ball, Ashton has boosted his try tally by picking such low risk, high reward battles and should be a model for both left and right wingers. Just Let the Kids Play! The more I learn about former Bath and England coach Brian Ashton’s style and philosophies of coaching, the more I count him as a man who’s ideals fit that of my own. I’ve been following his blog for a few months now, and always find myself agreeing with his sentiments on the modern game. And while he was a player of the old school, I feel his thoughts on how the modern game should be played are right on the cutting edge – possibly because they might be rooted in a time before professionalism got hold of rugby in the 1990s. I will not leech off his latest blog post, which can be read here, but in discussing how “street games” (the ways in which we played as children) present a perfect model for learning any sport I think he is spot on. I honestly believe rugby is too fast, too continuous, and too dynamic for coaches to have a direct impact on how a game unfolds while it is being played. Between the opening and closing whistles it is the players who must – to paraphrase a clever mantra I read recently – Scan – Think – Communicate – Act. They are at the tip of the proverbial spear and as such should be almost exclusively responsible for how the game unfolds. In one of my Masters courses, I recently presented a coaching model for managing staff members in a library. One of the points that I stressed to my class was that the Dictatorial style of coaching is often the default as leaders tend to feel most comfortable when they have total control. And such a style might work for sports like football and basketball which have a lot of stoppages and planned moves which can be delivered by coaches who can take the allowed time to impart his/her expertise. Rugby, however, is as I said above too fast, continuous and dynamic within those realities for us to be able to do that – yet that is how most rugby coaches go about their craft. If you haven’t yet read Brian Ashton’s post, he argues that the unstructured environment is the best way for rugby players to acquire the skills necessary to deal with rugby’s dynamic realities. 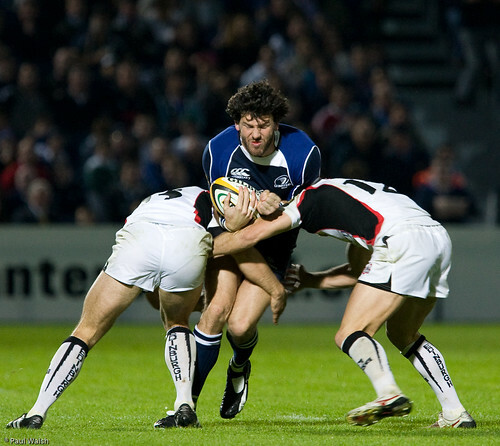 Obviously players need to be given varying degrees of instruction so they know the elements of the game, but too rarely – if at all – are they allowed the chance to just, as Sir Ian McGeechan says in his wonderful series of videos: “play rugby”. At most, teams will finish with 20 minutes of un- or semi-opposed where the starting line runs their set patterns against the few subs available. But real games never play out like that. Alternatively, we should be giving players the opportunity to play against equal numbers in as close to game conditions as possible. Even where numbers are limited, I would argue that 8 v 8 is better than 15 on none. If one thinks about it, rugby is really a series of microcosms featuring a few attackers versus a few defenders in an ever-changing open environment. And while I think box drills are a good starting point, I think players need to moving to an un-scripted / un-structured environment as soon as possible. I know it’s hard for coaches to do, especially if time isn’t on their side in a short season / with few training sessions a week, but not only do I think we need to provide players with more of these opportunities, we have to learn to keep our big mouths shut during them as well. We learn by making mistakes. Allowing players to do so and try new things will allow them to eventually discover a range of possibilities. In such scenarios, I think the coach’s role should be to observe and foster problem solving, not direct and provide answers. When things go really bad and teams are going nowhere, then try imposing restrictions which will open things up a bit or ask them questions which get to the root of ‘why’ things aren’t going well, with follow-up questions which will eventually lead them to the answer. I do this for both skill and technique. A lot about sport is logical even for relative newbies – if you ask the right questions. Without a doubt, South African Fourie du Preez is one of – if not the – premier scrum halves in the world game. He is the complete passing, running, defending, and kicking scrum half who marshalls his forwards about, running the show for the Bulls and steadying the Boks. In a losing cause against a spirited and determined Blues side this weekend, he attempted something that some might consider silly but I’d argue was potentially brilliant. Despite du Preez’ cheeky smile and possible plea that it was not forward, the ref was having none of it. It’s a scrum half’s duty to try … but I think the announcers are arguing that he intentionally threw it forward as the lesser of two evils, and I completely agree with them. On one hand, if the ref missed it and they’d gotten away with it, well done you lucky so-and-so. On the other, a desperate move gone wrong … I don’t think so. With Rudi Wolf on the prowl, likely to drive him into touch, or worse, smash him and dislodge the ball, a forward pass and scrum was just what the Bulls needed to relieve the pressure. This simple little decision by an obvious student of the game quite possibly saved the Bulls from conceding a try, or at least having their key man smashed in the ensuing tackle and ruck. Definitely a sign of brilliance. Continuing on from my last post on the joys of seeing small wingers given their chance, I would like to talk about another position which has again become as dynamic as it once was thanks to some ‘little guys’ – that of Inside Centre. I don’t know where the 6’4″ 220+ lb centre came from, but like one of the factors behind the big winger, I suspect Rugby League influenced this trend as well. Who needs creativity when you can simply run over the small back in front of you, and why wait until the ball gets to the wing when you can do it from the first fly half pass? I think the South Pacific was the worst for this – virtually the only spot outside of the North of England where League is actually popular – but the South Africans have had these as well. These are countries, though, where they do grow their boys bigger than most and surely there were many school coaches who thought about sticking a big lug in the 12 jersey to run over the typically smaller boys in front of him. This does nothing for their development, though, and many players have made it to the professional level on this reputation only to be ‘found out’ once they get there – 6’4″ 245lb (now ex-) Scotland centre Rob Dewey comes to mind. There are a few big inside centres who have displayed an impressive range of skills – like one of my favs, former England international and World Cup winner Will Greenwood, and South African danger man Jean de Villiers. And while their skill and awareness is as apparent as their size, both these men are hardly beefy centres. They are quite lanky and as such have an excellent range of movement. They, like most of the smaller centres these days, have the ability to provide a dynamic attacking threat in a multitude of ways. I think this is especially useful given that defences are so well organised these days that ‘bashing’ centres offer nothing in the way of attack apart from someone to (attempt to) punch a big hole in the defensive line. This tactic rarely works at any level given that defences are often most organised in that channel. Bashing into the line often results in a scramble on the ground just to retain possession and tends to yield slow ball at best. I would prefer to see an inside centre step his/her way around the defence or make a timely pass to the other backs for them to do so. This should be considered a position with a great potential for launching a dynamic attack when one considered that the inside centre can have up to six (fly half, scrum half, open side flank, full back, outside centre, blind wing) support runners in range of a single pass. Looking around the professional and international rugby world, I’m glad to see more players in the 12 jersey who do this well. Unfortunately, we still see a lot of ‘Bashers’ in Canadian rugby who hinder our ability to attack out wide. We should look to the Kiwi philosophy and these players as a model for future development in our young backs. I started focusing on this a few years ago in two ways. For one, I banned the 10/12 switch back inside. Even worse than seeing a 12 run straight into his opposite number, this ‘play’ sees the inside centre running into the Post, Guard, Ball ruck defence unit, often with no gain in ground and the ball under threat. Proponents argue that it sets the next phase, from which the other backs can attack, but rarely does it remove any defenders from in front of them and causes the forwards to have to do more work to secure the ball that should have been used more wisely in the first place. My second step toward conversion was adopting the Kiwi name for this position – the 2nd5/8th. If you watch enough rugby from New Zealand, you’ll have probably heard this name before and been at least slightly confused. To give you yet another rugby history lesson, the Kiwis were the first to believe that the ‘stand off half’ – the player who regularly received the ball from the ‘half back’ (scrum half) – should run the ball occasionally and often rather than simply move it to the ‘three quarter backs’ (centres and wings). Do you see a trend growing here? This became a specialist position, rather than simply the first of the backs to get there, and the Kiwis wanted to give it a name. Simply put, they figured that with a half back, a full back, and a three-quarter line in between them, the player between that group of backs and the half back should also have a fractioned name. So what comes between 1/2 and 3/4s? Why if you round up the common denominators, it’s 5/8, of course! The Aussies still use this term in both Union and League for what the rest of us call ‘fly half’. Following the success of this style of play with the 1905 All Blacks ‘Invincible’ side, they had another player with this attacking prowess and similar range of skills, so began calling him the 2nd 5/8th (or ‘second five’ for short), and the names stuck as has their attacking philosophy for the most part. Several current Kiwi fly halves have got their start in the 12 jersey, or regularly swap between 10 and 12 as they see the positions as being similar. Dan Carter, Stephen Brett, Luke McAlister, Daniel Bowden, Isaia Toeava, Stephen Donald. Others who play there had / have had to develop their passing and kicking skills to account for better organised and committed defenders in the last decade – Aaron Mauger, Ma’a Nonu, Callum Bruce, Sam Tuitupou, Benson Stanley, etc. This has put the Kiwis ahead of the game, so to speak, in proving that a bashing 12 isn’t as useful as one who can run, pass, kick and still make his tackles. England tried playing Charlie Hodgson and Jonny Wilkinson in a ‘two fly half’ system once, but I think gave up on it too soon before giving them a fair chance to establish a partnership. 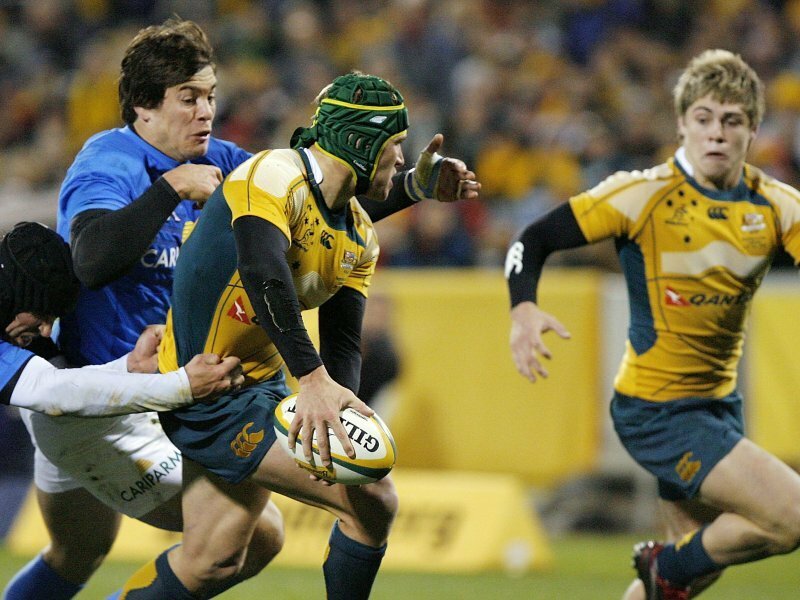 Currently, Australia are showing how well it can work when they play mixtures of Matt Giteau, Berrick Barnes, Quade Cooper, and James O’Connor together (not to mention other dynamic Aussie 12 options like Christian Lealiifano, Kurtley Beale and Anthony Faingaa). In short, if you consider a fly half your best attacking weapon, then what’s the harm of having two of them in the 10 and 12 jerseys? Working together, they can be even more of a threat to the defence and a benefit to team mates in providing them with attacking opportunities.